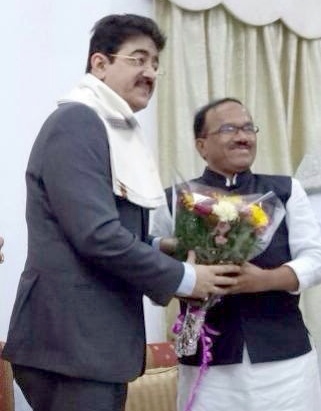 The Chief Minister of Goa honored Sandeep Marwah with a shawl and a flower bouquet on his visit to the Chief Ministers office at Goa. “The country of India is proud to have sons like Sandeep Marwah. He is not only patriotic and nationalist but has work tremendously and created five World Records in Media,” said Laxmi Narayan Pareskar Chief Minister of Goa. “Being an educationist I can understand the efforts in building a brand in education like Asian Academy of Film And Television,” congratulated Chief Minister. The meeting was attended by H.H. Acharya Dr. Lokesh Muni of Lokesh Ashram, Acharya Satyendra Narayan of Confederation of World Religion and Dr. Gopal Ji of Global Yog Alliance.